The Soho Theatre began life as the Soho Theatre Company, founded in 1969, by Fred Proud and Verity Bargate. Their original performance space was in New Compton Street, before they moved to a small basement leased for the Soho Poly (Polytechnic of Central London, Soho). From there, they performed lunchtime productions every fortnight, including premieres of plays by David Edgar, Caryl Churchill, and Timberlake Wertenbaker. The company switched to evening productions in the early 1980’s. In 1990, after the company had outgrown its space (and after Verity Bargate’s passing in 1981), the company left its original space and produced works in Riverside Studios, the ICA, and the Royal Court before taking up residence at the Cockpit Theatre from 1993-1995. During this period, they expanded their Writers’ Development programme, and presented multiple premieres of new writing. After securing an £8 million Lottery grant and an additional £2.6 million funds raised, work began in 1997 on a new home for the Soho Theatre on Dean Street. The building opened in 2000. 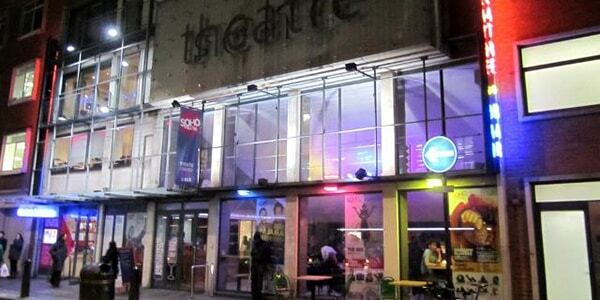 The modern Soho theatre houses a 140 seat auditorium, an 85/100 seat studio space, and a 150 seat cabaret and comedy venue. The theatre runs several workshops for young people, including children as young as 3 all the way to 26. The theatre also offer extensive opportunities for writers, including workshops, events, and the Verity Bargate Award.